Graduated student loan repayment gives you the ability to “start low, then grow” with your monthly loan payments. Most people assume federal repayment plans for student loans are only relevant if you’re struggling to make your payments. However, plans like graduated repayment help you pay off your loans efficiently. This minimizes total interest charges and can decrease the amount of time it takes to repay what you owe. Graduated repayment is the second most efficient method of federal loan elimination after standard repayment plans. Standard plans focus solely on paying off debt quickly. By contrast graduated plans attempt to account for income challenges at the start of your career. This is basically the federal government’s way of acknowledging that recent graduates often have low starting salaries. As a result your monthly payments start lower than they do with standard repayment. 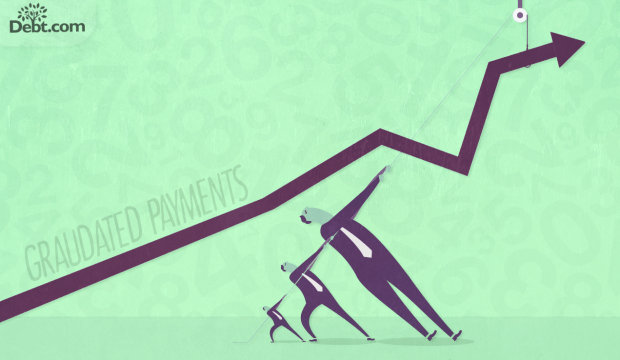 After two years, your monthly payment amount increases by 7%. Then it increases again by 7% every two years until your loans are fully repaid. The idea is that over the two-year span you should get at least one raise or promotion. As a result, you have more money available for repayment. This plan reflects that and helps you use career and income advancement to your advantage. What is the current average base pay increase for American workers? Tip: Analysts estimate the base pay increase will remain at 3% in 2014 – this is roughly 1% lower than the yearly averages just prior to the recession in 2008. What loans are eligible for graduated repayment? Just like a standard repayment plan, graduated student loan repayment allows you to include more loans than other programs. Hardship based programs typically don’t apply for PLUS loans to parents. Standard and graduated repayment plans, however, do. Really, the only loans that can’t be included are Perkins Loans and any private student loans you took outside of your federal financial aid application. Do you plan to include a Direct or FFEL Consolidation Loan in your repayment plan? If so, how much total student loan debt do you have to pay back? If you don’t have a Federal Consolidation Loan, then it’s pretty straightforward. You have a choice between a 10-year Graduated Repayment Plan and a 25-year Extended Graduated Repayment Plan. The 10-year plan means higher payments, but it minimizes time to payoff and total interest charges. The 25-year plan lowers the monthly payments so it’s easier to manage. However, that means you pay more over time to eliminate your debt. You can also use Extended Graduated Repayment even if your plan includes a consolidation loan. For instance, if your total education loan indebtedness is $15,000 then your plan should take 15 years. However, you can extend it to 25 years if you need lower monthly payments. Just like when you applied for loans through FAFSA, credit score has nothing to do interest rate on repayment plans. You can have a great credit score or rock-bottom bad credit; it doesn’t matter. The interest rate applied to your debt on a graduated repayment plan will be the same in either case. Interest is calculated by taking a weighted average of the rates applied to your original loans. In other words, it basically takes of average of the rates on every loan you include in the program. Loans for larger amounts have more “weight” in the final interest rate calculation. Although the payments start out lower than what you would pay on a standard plan, it changes over time. Since payments increase by 7% every 2 years, you may finish with payments that are significantly higher than standard plans. This could cause problems down the road if you don’t advance through your career as quickly as you’d hoped. The incremental increases may exceed what you can afford with slow income growth. Luckily you can always switch plans if it turns out the graduated plan doesn’t work for you. You can move into a standard payment plan or even a hardship-based plan if you have severe income challenges. So choosing graduated repayment isn’t set in stone. Extended graduated repayment can apply to basic plans that don’t include consolidation loans. But it can also apply to plans that include consolidation loans in some cases. The extension doesn’t really apply if your total education indebtedness is over $40,000. That’s because plans for than amounts that are higher than that already have terms from 25-30 years. So essentially there’s nothing to extend.